Info: Maaya’s blog entry about this release found here. Song info: Chikyuu Shoujo Arjuna [Earth Maiden Arjuna] fourth episode ending theme. Maaya’s liner notes: The place you go to, what is it like? Song info: Chikyuu Shoujo Arjuna [Earth Maiden Arjuna] tenth episode opening theme and first, second, fifth, sixth, eighth, and eleventh episode ending theme. Notes: A mame-shiba is a type of dog, specifically a smaller toy version of the shiba-inu (mame means bean and is used to refer to small versions of something, and shiba refers to the breed and does not translate). You can see a picture of one here. 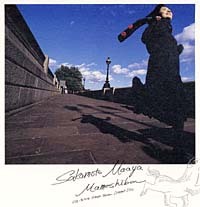 In the music video for this song, Maaya is being chased by a real mame-shiba. Info: Maaya’s blog entry about this song found here.